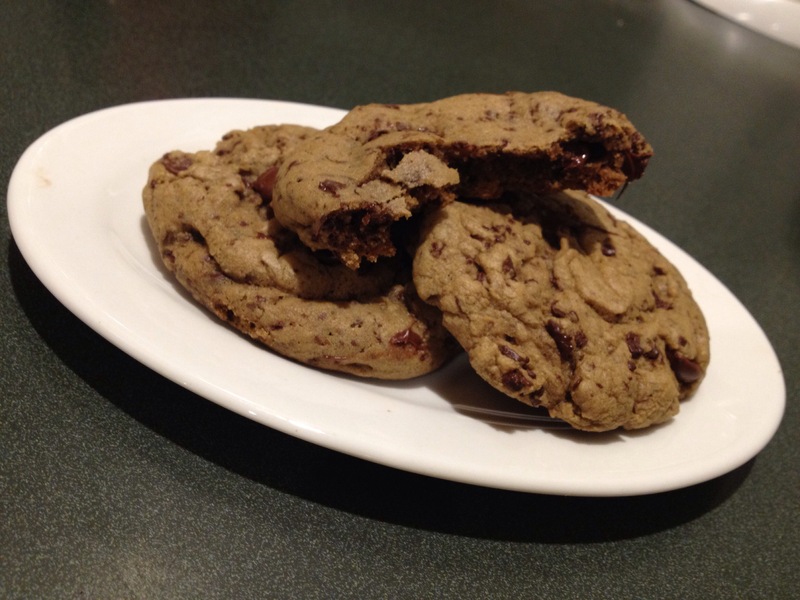 I love a good choc chip cookie, but I’ve found it hard to find a recipe that I actually LOVE. Until now. I found a great recipe on Pinterest (original here: http://sallysbakingaddiction.com/2013/05/13/chewy-chocolate-chunk-cookies/), but decided to change it up to make them even better. I ended up taking these to work and got a fantastic response – everyone loved them. The best part of this recipe is the fact that you don’t have to cream the butter and sugar! That’s right…no electric mixer required. It is essential that you refrigerate the batter for at least 2 hours, but it will keep in the fridge for up to a week and also freezes really well. I’ve also made a different version for Christmas – white chocolate, coconut and cranberry (recipe to come), but the possibilities are endless as to what you can add. Just use the base mix and use your imagination! Never have any time for whipping up fresh cookies? Why not make the dough, roll it into a log in cling wrap and freeze it? You can take out the log and cut off single cookie servings, meaning you can cook a fresh cookie or two for your afternoon cup of tea in 13 minutes (cook straight from the freezer!). How awesome is that?! This is going to be one of my holiday activities…prepping cookie dough so I’ve always got some on hand! 1. In a large bowl add flours, baking soda and salt and grated chocolate and stir to combine. 2. In a separate bowl add sugars to melted butter and whisk until smooth (don’t worry if the butter and sugar doesn’t mix together, something magic happens when you add the eggs and it all combines). Add eggs and whisk to combine. 3. Add wet ingredients to dry ingredients and mix until combined. Add choc chips and stir. 4. Refrigerate dough for minimum 2 hours. 5. To cook: Preheat oven to 180degrees Celsius. Grease and line cookie sheets with baking paper. Take tablespoons of dough and roll into balls. Place on tray and lightly press the cookies so they aren’t balls. Bake for 12-13* minutes and cool on tray for 5 minutes before transferring to a wire rack to cool completely. * Baking time depends on how soft or crunchy you like your cookies. I baked mine for 12 minutes and they were slightly crunchy on the outside and gooey and soft in the middle. Add a couple of extra minutes bake time if you like crisp, crunchy cookies. Store in an airtight container for up to a week (not that they’ll last close to that long!). Great recipe. We’re so gonna makes these!